Facing south, overlooking Agios Lazaros Bay. Mykonos Town is 4 km from the villa, the closest shop is 3 km, and the airport is 5 km away. The nearest beaches or Psarou and Platy Gialos are 3 km from the property. Eros is the perfect match for those seeking a high standard experience from all points of view as it epitomizes everything one could look for in a villa: a great position and stunning interiors enriched by all modern comforts. 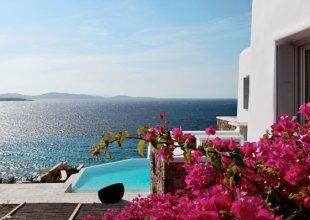 Located in a private ultra-exclusive villa resort, Eros is one of Mykonos' most sought after properties when it comes to meeting all expectations of luxury. The villa guarantees privacy thanks to its location on the estate and the 24 hour security service offered while also providing all options to VIP clientele due to the availability, upon request, of a private helipad and a small dock access for tenders. 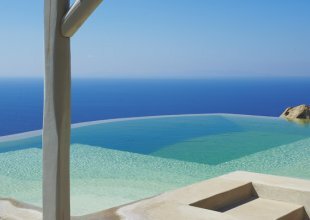 The outdoor areas all boast unforgettable views over the Aegean Sea, in particular the bay of Agios Lazaros, thanks to the waterfront position of the villa. The outdoor dining and living areas and the pool terrace are meticulously furnished with designer furniture, while the attractive infinity pool can also be heated upon request. Designer furniture is also featured throughout the interiors with top of the line appliances in all rooms, distinctively proves this villa to be flawless when it comes to offering comfort, luxury and technology. The kitchen is located on the main level along with the formal dining area and living room. A second, smaller, kitchen is located on the lower level, leading to the staff quarters. Eros is a 360-degree experience of pure bliss. The quality of each single detail will surprise the most demanding guests from the moment of their arrival. Our Concierge Team is at your disposal any time before and during your stay to take care of any necessary extra arrangements you may need. We have chefs and assistants available to take care of every aspect in the kitchen, from groceries, to cooking and serving in the comfort and privacy of your own property. To complement your villa experience, we also offer a selection of daily yacht charters to discover the island's best kept secrets by sea. And for that little bit of extra pampering, we have selected a team of professional therapists available for beauty and spa treatments in the comfort and privacy of your own property.